Share access to your latest business numbers with us – so everyone is up to speed. 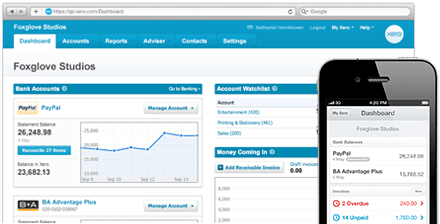 Xero accounting software lets you work anywhere. Bank feeds automatically import and categorise your latest banking, credit card and PayPal transactions. Just click OK to reconcile. Create and send professional invoices & get paid online. Manage cashflow by scheduling bill payments and sending invoices automatically. Manage all aspects of your business by using powerful add-ons for CRM, inventory, timesheets & job management, plus other specialised tools that seamlessly integrate with Xero online accounting. Payroll, fixed assets, expense claims, budgets, complete financial reporting – all done beautifully, when and where you need it: at work, home, or on the go. Login anytime, anywhere on your Mac, Windows, iPhone or Android. It’s simple, smart and occasionally magical.